Karwa Chauth is celebrated during Krishna Paksha Chaturthi in Kartik month. Karwa Chauth coincides with Sankashti Chaturthi a fasting day observed for Lord Ganesha. 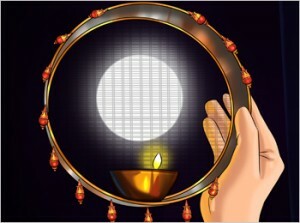 The fasting of Karwa Chauth and its rituals are observed by married women for the long life of their husband. Married women worship Lord Shiva and His family including Lord Ganesha and break the fast only after sighting and making the offerings to the moon. The fasting of Karwa Chauth is strict and observed without taking any food or even a drop of water after sunrise till the sighting of the moon in the night. Karwa Chauth day is also known as Karak Chaturthi. Karwa or Karak refers to the earthen pot through which water offering, known as Argha, is made to the moon. Karwa is very significant during Puja and it is also given as Dan to the Brahmin or any eligible woman.